Private Selection (Kroger) Sea Salt & Balsamic Vinegar — Thickly cut and marcelled, these flavorsomely earthy spuds pack a hearty wallop, particularly so by virtue of being fabricated by a kettling method. Despite the methodological hazards entailed by this process, there are very few imbricated chips — a tasty testament to the judiciousness of the anonymous masterchipper. The seasoning-profile presented by many salt & vinegar entries can occasionally grate the nerves, the vinegar being so strong as to chemically abrade the tongue's tender squamous after only a few rounds. Here, however, the seasoning is applied with a deft touch. The result is a remarkably eatable salt & vinegar iteration which spares the palate much of the stereotypical aftershock. Undoubtedly, the seasoning's unusually high content of added sugars not only helps ameliorate these residual shocks but also adds further organoleptic complication, though this sugar-content is not so high as to intrude upon the classicality of the experience. A notable chip, this is no meretricious abuse of the Kroger marque, but a studied entry in an already saturated field. Boulder Canyon Turkey & Gravy — With the crisp days of autumn turning the nation's collective heart towards the smell of loam and deep decay, the gustatory appetites of chipmasters are, invariably, similarly piqued. Evidence, you say? Enter the turkey-and-gravy chip courtesy of our fine compatriots at Boulder. This one's a no-brainer, as few foil could better support so prodigious a presentation of gallinaceous savor as that earthy tuber, especially as fabricated by experts in the kettling arts. The first taste is of gravy. Gravy in full-effect. Suffused by the vital juices sweated out that proteinaceous bird. Sage and thyme? They're here, too. 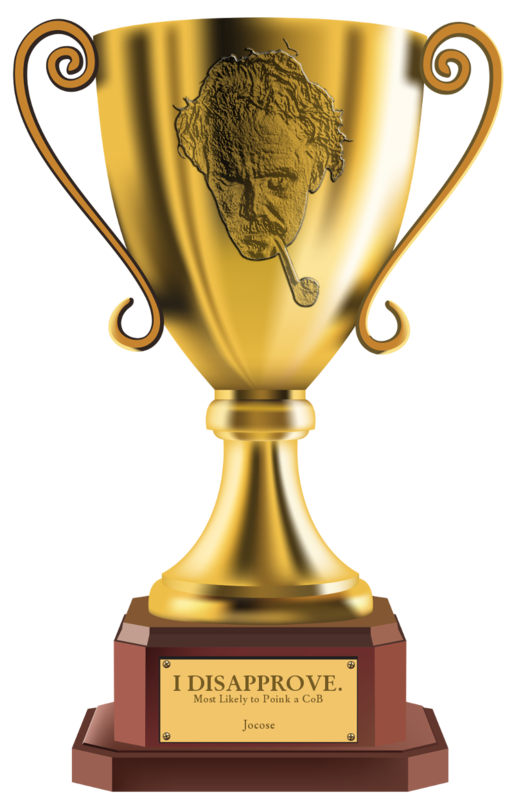 And though this eats much like a premium kettle-chip dipped in Heinz jarred gravy, and though one might identify the sad spectacle of a lone and enshadowed figure wanly munching on ever-dwindling crumbs of faux-turkey potato chips on Thanksgiving Day as an infallible mark of a total loser, I wouldn't have it any other way. Na zdrowie! I'm just glad somebody is doing this. Rue Farms Sea Salt & Pepper — Pepper. What more condign stratagem could be devised but the wiving of that aromatically pungent corn to those crisp-fried lamina all right-thinking men adore? Yet for years — aeons, seen in retrospect — this divine scheme remained unrealized, unthought and uneaten. The task fell — whether by blind chance or inscrutable cosmic design, I know not — to those loathsomely mercurial hipsters. Yes, I speak here of chipsters. Quirkily due to a minor trend ascendent amongst their hated kind, Salt & Pepper was finally enshrined as an Immortal in the Flavored Chip Pantheon, being eaten even by those brusque and brooding chipmen of few words. Mysterious ways, indeed. Using only Ohio-grown, non-GMO russets and a judicious smattering of quality spices, these rugged chips — often with bits of skin still adhered — boast an intense flavor and a prodigious crunch. And unlike the more ubiquitous Salt & Pepper presentations which add a melange of tertiary spices — onion or garlic along with sugar and powdered dairy, these chips boast seasonings of austere purity: salt and pepper and nothing else. Both bucolic and cosmopolitan, simultaneously subtle and bitter and sweet, Rue Farms has crafted a winner. Downey's BBQ — The Irish? And potatoes? Do they mix??? I'm happy to report that, all expectations to the contrary notwithstanding, they do. They do, indeed. Felicitously and deliciously. 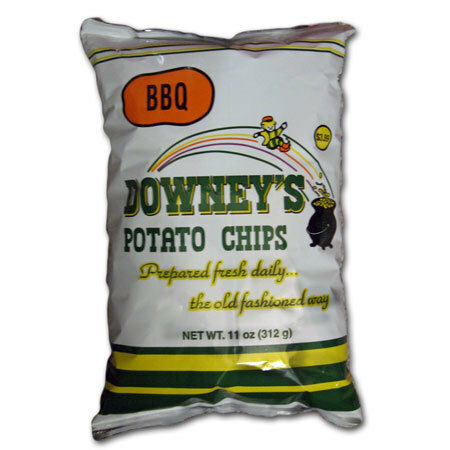 On the surface, Downey's could be said to be yet-another-iteration of the classical American chip, and aye, it is that. Standard, unpretentious white chipping-potatoes. Partially hydrogenated vegetable oil. This checks all the rote boxes. But is that a bad thing? By now, gentle reader, you know the answer. In addition, the chips are given a slightly thicker cut and, perhaps, fried at a lower temperature, which go a long way toward adding a personal flourish. Further, the BBQ seasoning (not one of my most go-to flavors, BTW) is similarly understated, its mild sweetness supplementing the basic potato-flavor upon which it never obtrudes. Exhibiting nothing trendy with which to commend itself, this regional find shows that quiet classicism, executed with conviction and constancy, will always be in style. Even if it comes from the most unexpected of corners. Erin go bragh! 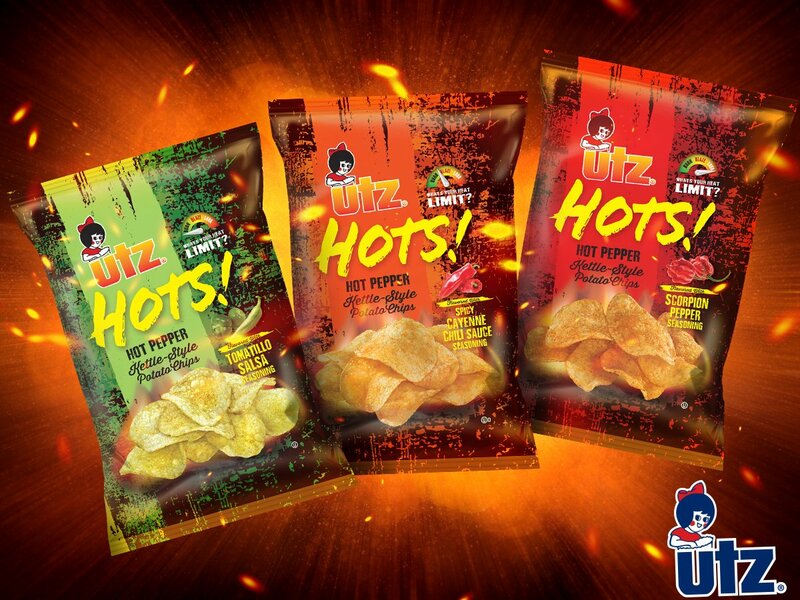 Utz Hots! 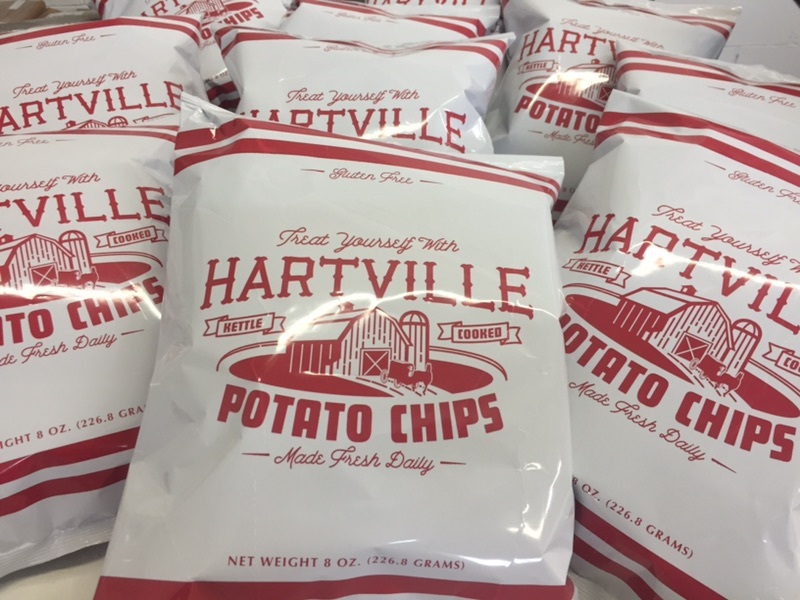 — This triumverate of tinglingly taterlicious tastes — representing something of a gastronomic experiment — comes to us from Utz, a company from which pushing boundaries implicitly assumed as sacrosanct by the often staid and button-down world of mainstream chipiculture is not something we'd immediately expect. Therefore, all-the-more delighted we were to be hurriedly ushered into Utz's arcane lucubrium — a Wonkaesque, phantasmagorian crucible birthing flavor as lead and gold in the fiery heart of a solar forge — that we might partake of this pack of potatoey piquancy. In short, while these hit all the usual keys which we'd expect from Utz, they are certainly not iterations on the typically Pennsylvanian "Red Hot" theme, and in fact, may well be, even in their most incendiary incarnation, less hot than Utz's production of that Keystone staple. In terms of ranking, though I tended to preference the Scorpion (nicely complimented with the tang of lime, BTW), it was perhaps, the Cayenne which most showcased an unabashed chile flavor, though the overall profile was also the most austere. The Tomatillo was especially joyous and companionable: the sour notes being aptly offset by the sweet, and the complexity never devolving to chaos. Though it might be true that, launched solo, no single entry would justify its existence, this triad is all about the gestalt. Potato chips on Good Friday? His penance shall be posting news articles about the thieving South American bishop. The photo on the chip bag is not the same photo as on the sign. Utz Carolina Style Barbeque — Two great tastes that taste great together. Reese's, right? Wrong. Instead, take heat, that faintly bitter piquancy contributed by the inestimable chili pepper, and judiciously juxtapose it against salt-&-vinegar. One might very well have the ultimate chip. At least, the ultimate chip for general-purpose, everyday munching. A chip ordinaire, one might say. The placid sky-blue hue which dominates the packaging jauntily hints as the ethereally savorsome mélange enfoiled within. A taste-tantalization firing on all cylinders — bracing but never enervating — this perennial offering from the House of Utz is highly commended. Good to see this thread resurface. Who doesn't like potato chips? 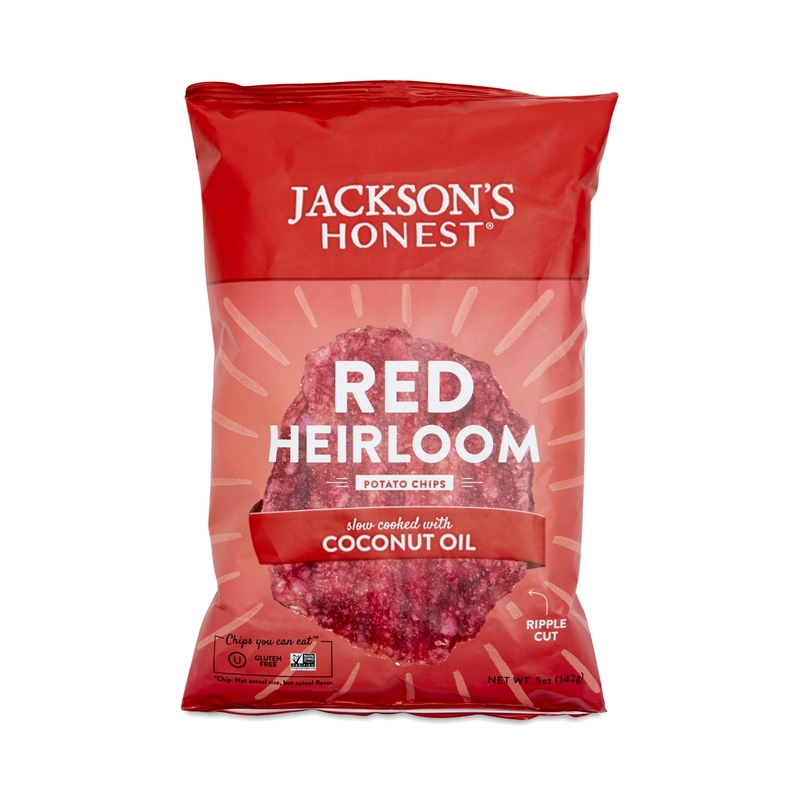 Jackson's Honest Coconut Oil Red Heirloom Ripple Cut — Here's something a little different: a Food Science-based chip. The theory behind the brand is that of a gentle, lower-temperature frying in pure saturated oils leads to a chip rich in nutriments. Is that so? Perhaps. But there is no denying that the process results in a gustatorily delightful soupçon of idiosyncratic character and intriguingly subtle flavor range. As to the degree of character imparted by the red heirloom tater, I cannot speculate. The earthy potato flavor is clearly delineated, though this might well be so with a cultivar of lesser pedigree. However, I share no such reticence when it comes to the chosen oil. The coconut aroma is penetrating. The flavor, unctuous. Note well that these chips are very thickly sliced, deeply crevassed by the rippling, and fried slowly. The sum of these preparation choices eventuates in a toothsome chip, indeed. The prodigious crunch of these beauties likely precludes casual munching with burgers or dogs. Though culinary pairing may not be wholly proscribed, mindful munching is — in any event — indicated. I haven't eaten any out of this bag... yet. Trying to stay keto.